Preheat oven to 350°F. 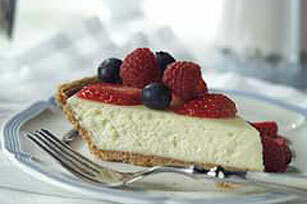 Beat cream cheese, sugar and vanilla in large bowl with electric mixer on medium speed until well blended. Add liqueur; mix well. Add eggs; beat just until blended. Bake 35 to 40 minutes or until center is almost set. Cool. Refrigerate 3 hours or overnight. Top with berries just before serving. Store leftover cheesecake in refrigerator. This berry cheesecake is the perfect choice for a special occasion. Plan ahead and eat accordingly before indulging in a slice of this cake. Place completely unwrapped packages of cream cheese on microwavable plate. Microwave on HIGH 20 seconds or until slightly softened. Prepare as directed, substituting 1 tsp. almond extract for the almond-flavored liqueur.